There is a craft story behind ANN SACKS that goes beyond its mission to seek out the finest ceramic, porcelain, glass, and stone tile. In fact, it can be found at the doorstep of our Portland, Ore. headquarters. For over 30 years, our ANN SACKS factory has produced a remarkable breadth of ceramic tile designs – from our prestigious guest designer series to the in-house collections that have become a staple within the company. 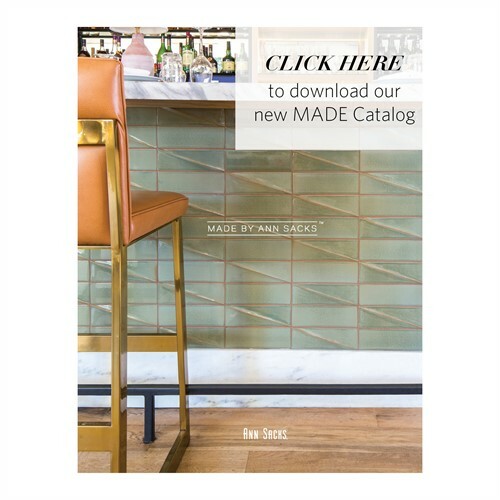 Rich in heritage, traditional in craft and modern in scope, MADE by ANN SACKS™ encompasses 14 handcrafted ceramic tile collections made at our Portland, OR factory. This colony of craftspeople, from artisans and ceramicists to engineers and manufacturing technicians, are an intricate part of the ANN SACKS family. Through creative collaborations with visionary designers like Barbara Barry, Robert Kuo and Kelly Wearstler, we offer unique collections melding fine art and craft. Employing rich Oregon clays, these gifted artists have made their visions a reality in our earthenware and stoneware tile designs. In addition to our Designer collaborations, our in-house collections range from modest to luxurious in look and feel as well as price. Specify from our palette of 150 earthenware and stoneware glazes, or bring your unique idea to life with our custom capabilities. Each MADE by ANN SACKS collection is meticulously crafted by hand in our Portland factory using time-honored techniques, sustainable practices, and the latest in technology to produce a product that is second to none. MADE by ANN SACKS represents our commitment to bring you tile collections that reflect passion, ingenuity, and most importantly, true handcraft – an art form that we will never let go out of style at ANN SACKS.